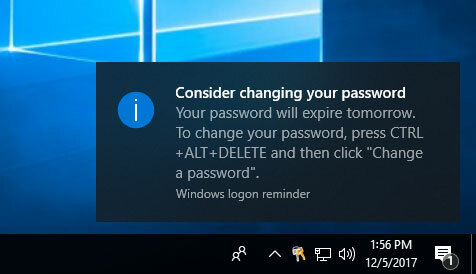 Before your Windows password expires, you may receive password expiration notification every time you log on to local account or domain user. 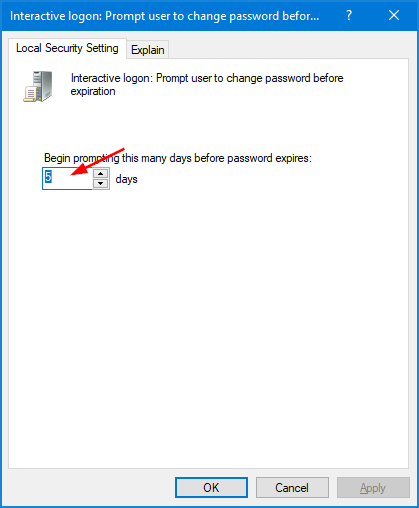 In this tutorial we’ll show you how to set the number of days prior to password expiration, during which to begin displaying password expiry notice to prompt user to change Windows password. Open the Local Group Policy Editor and navigate to: Computer Configuration\Windows Settings\Local Policies\Security Options. Next, double-click the “Interactive Logon: Prompt user to change password before expiration” policy on the right pane. Enter the number of days prior to password expiration that you want to notify users, and click OK.
Reboot your computer for the policy to take effect. Double-click the PasswordExpiryWarning value on the right pane. 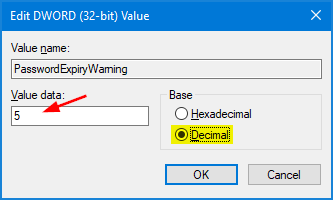 Click the Decimal radio button and enter the number of days before password expires that you want to notify users, and click OK.
Close Registry Editor and reboot your computer. Click the Start button, select Administrative Tools and then click Group Policy Management. In the console tree, expand the Forest -> Domains -> your domain. Right-click the domain policy you want to work with, and then select Edit. When the Group Policy Management Editor window appears, navigate to Computer Configuration\Policies\Windows Settings\Security Settings\Local Policies\Security Options. Then double-click the “Interactive Logon: Prompt user to change password before expiration” setting in the right pane. 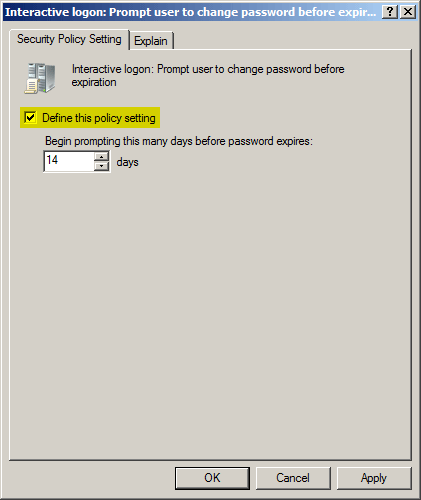 In the Security Policy Setting tab, check the “Define this policy setting” option, and enter the number of days in advance users are warned that their passwords are about to expire. Click Apply and then OK. Reboot your server.